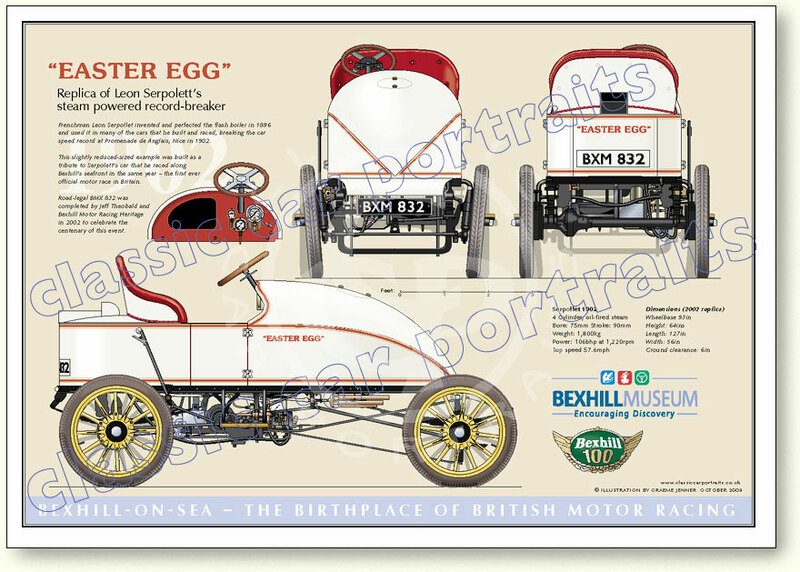 PLEASE NOTE: print of Serpolett shown below only available to UK residents from the souvenir shop at Bexhill Museum. Bexhill Museum. Frenchman Leon Serpollet invented and perfected the flash boiler in 1896 and used it in many of the cars that he built and raced, breaking the car speed record at Promenade de Anglais, Nice in 1902. This slightly reduced-sized example was built as a tribute to Serpoletts car that he raced along Bexhills seafront in the same year  the first ever official motor race in Britain. Road-legal BXM 832 was completed by Jeff Theobald and Bexhill Motor Racing Heritage in 2002 to celebrate the centenary of this event.